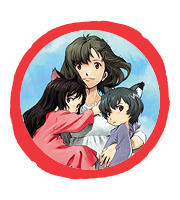 Hana, a woman who falls in love with a Wolf Man, gives birth to two half human, half wolf children. After the tragic death of her beloved, Hana seeks refuge in a rural town where she attempts to build a life for herself and her children. This multi award-winning beautiful anime film will be a family favourite for years to come.